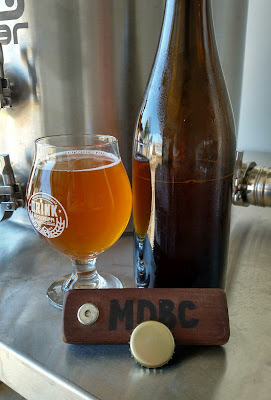 After getting ready for my first brew day on my new system I decided to pop a bottle of the beer I'm calling Kathleen. 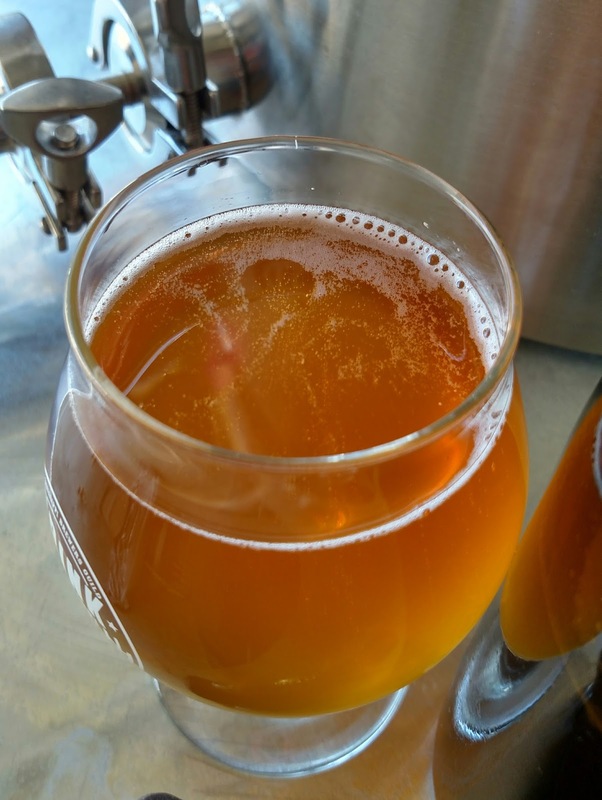 While I envisioned this beer as being my provision style Saison that is aged for a while to bring out more character of wild yeast an bacteria, the culture I used in this beer acted extremely fast. The pH dropped substantially, despite having almost 20 IBUs, in just a few short weeks. This had me thinking the process again and how I would approach it each time. I already know I don't want to use Pale Ale malt for the base next time. Traditional Pilsen malt is much better as it won't leave as much residual sweetness. You can find the recipe and info on the beer here. My tasting notes are below. Appearance: Pours deep golden almost orange. Really clear on the first pour as well. A white head forms about one and half fingers thick. Quickly dissipates to just a thin ring around the glass. There are bubbles streaming up the sides and they do so almost the entire time I drink. I had feared the carbonation was way too low but it seems there is more than I had expected. It's still a bit lower than I want but it's not flat and I'm glad of that. Little bit of lacing on the sides of the glass but nothing excessive. I did ferment this on an oak spiral so I'm wondering if that has any effect on the head retention. Most barrel aged beers I have tend to be lacking in that department. Overall I'm pleased with the appearance but look forward to it being a bit lighter with the Pilsen next time. Aroma: The first bottle of this beer I opened had a very muted aroma. It smelled very "young" as well. This bottle has opened up to showcase a lot of tropical aromas. Mango and pineapple are pretty prevalent. There is also some acidity in the form of lemon rind tartness as well. Just a hint of sweetness but it's a fruity sweetness and not something malty or like caramel. It has a slight hint of acid bite as well but not too bad. It seems to be just a little bit young still. Being that this was brewed in July and that it's just three and half months old, it may be still just a bit too young. The aroma is more wild ale than Saison. Not getting a ton of the great pepper and spice that 3726 usually delivers. I seem to have this reoccurring when I use a good portion of grown up bottle dregs. Still, it smells nice and I'm interested to see how it progresses. Maybe with time it will give a bit more funk from the brettanomyces in the dregs. Even with the shorter boil, I detect no DMS or anything like that. Flavor: First sip brings the lactic tartness and mango out. After you swallow and let it settle a bit, then some of the pineapple comes out. A little bit of green apple and some fruity sweetness are left on the palate. Definitely acidic but pretty pleasant overall. There is a bit of pepper and spice that I didn't pick up in the aroma but not as much as the sample before bottling. Still no caramel or malty flavors and I'm glad of that. I had worries using the Pale Ale malt that it would leave too much. There is some still there even though the beer finished very dry at 1.004. I believe the change in base malt will be much better. Reflective of the nose, I think this one is still a bit young. The dry hop of Aramis hops is detectable as well. I'm picking up the lemony, grassy notes from them. Again, I'm pleasantly surprised that I don't detect any DMS. I'm not always the best at picking it out but if there was a substantial amount from the short boil, I believe I would have gotten it. The brettanomyces may have converted it to something else. Mouthfeel: Medium to almost medium full body on the beer. I think higher carbonation would help with that. Over time that may happen. Just a bit of something left in the back of the throat after swallow as well. This too would be fixed with more carbonation. I bottled with 4.5oz of dextrose but going forward I believe I'll be using table sugar and in a little bit higher amount to get the carbonation levels I'm wanting. Overall: This is a very tasty brew. I can definitely detect the Hill Farmstead character in there. It tastes like a slightly sweeter, well aged Anna or Arthur character. Since I've brewed the last few beers with the dregs and the Saison yeast pitched at the same time, I've come to realize I like the character of adding dregs after primary fermentation. I do like pitching strains of brettanomyces with the Saison yeast but I think that when you use dregs that have been built up, they tend to take over and dominate the profile of the beer. While this one is still young in the bottle, I feel it is still a great brew. I'll report back periodically with how this one changes over time and see if we can find the sweet spot for age. This beer could have sat in primary a little longer but honestly I liked how it tasted and the gravity and pH had been the same for a while. Time will tell how this one changes. Parting shot of the new system for those who don't follow on IG or Twitter. 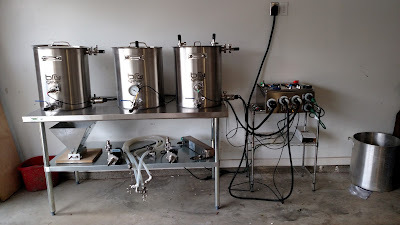 First run this past Saturday went great and I think I'll be able to produce a lot of great beer using this! Still have to get the panel mounted and add a few more things but right now she runs smooth! Follow on Twitter to see me Periscope and brew live. This beer definitely went through a couple of changes. A couple weeks after this tasting I pulled another and it had lost the mango and pineapple flavors. it was more subtle and plain it seemed. Then after a few more weeks in the bottle the tropical fruit flavors returned to balance out the tartness. Something else had shown up as well. There was a good amount of funk in the nose. It was like wet hay, old wet wood, and a bit of leather. It had an amazing balance and I really enjoyed it. It was tasted by another sour beer that was in the style of Lambic and this beer's nose rivaled that in the funk department. I can't wait to see how it further develops in the bottle! Wow awesome post! Can't wait to start homebrewing myself! I've been reading Markowski's Farmhouse Ales and experimenting with different farmhouseish beers sounds amazing. Thanks for reading and the kind words! That's a fantastic book! Mine is pretty worn out. I'll need a new one soon. Good luck with the brewing. And welcome to the Obsession!